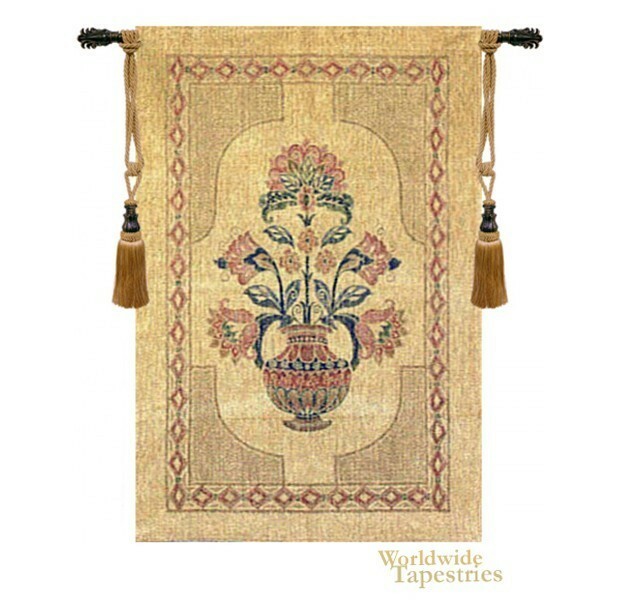 This Flowers in a Vase tapestry shows a chenille wall hanging featuring a vase with blooms. In rustic tones and traditional style, we see the still life of the bloom filled vase. Wall hangings with the floral theme has been used for centuries and here we see this in a rustic and traditional theme. Chenille is a type of material which is known for its distinct appearance and softness. This Flowers in a Vase tapestry is unlined, and has a tunnel for easy hanging. Note: tapestry rod and tassels, where pictured, are purchased separately.